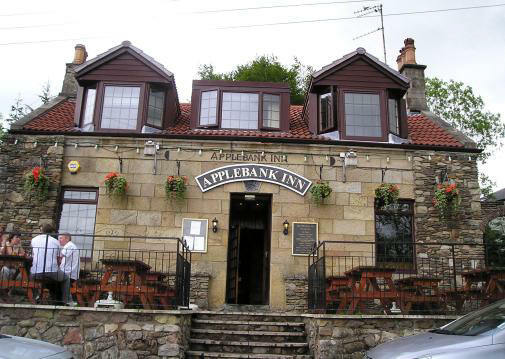 The Applebank Inn sits on 'Millheugh' (pronounced Millhew) in a dramatic position overlooking the River Avon. Built around 1740 it is steeped in history and reputed to be haunted. Broomhill House which sits on the hill above the Applebank was one of several large houses in the Millheugh area. It belonged to a Captain McNeil, a sea-faring gent, who sought his fortune in far-flung exotic locations. Legend says that the Captain returned from one of his adventures with a beautiful Indian princess, with whom he was very much in love. She was installed at Broomhill, but her happiness was short-lived. Her ignorance of Western customs made her a social embarrassment and the Captain forbade her to leave the house except at night. After a while, she was no longer seen at all and the Captain claimed that she had disappeared. However, her ghostly form soon returned to seek revenge. At first she was seen at the window of Broomhill, beckoning to passers-by. Then she was seen roaming the surrounding orchards and the area known as Morgan Glen. Her revenge on the Captain is not documented, but his death certificate states that he died of premature old age! The Black Lady was the subject of the first attempt to perform an exorcism live on television. It was in the 1960s, and the BBC team who visited the Larkhall site to document the event found that their cameras were freezing over although the weather was not cold. And was it the Black Lady who added the final macabre touch? When the filming was completed, the director set off for another location and was killed in a car crash. In August 2005 the Scottish Ghost Club held an overnight vigil at the Inn. Despite numerous reports from the Inn Proprietor and staff of objects moving on the own, knocking noises and rapid changes of temperature, no paranormal activity was witnessed. Therefore the case is still open on the strange goings on at the Inn. 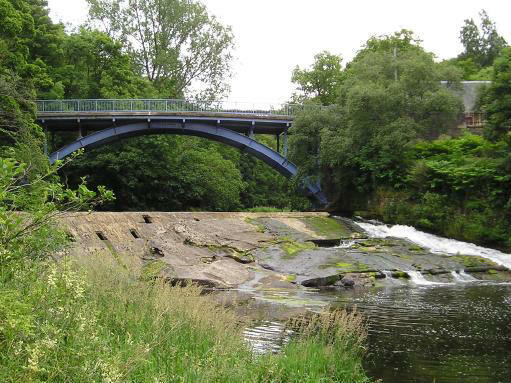 The Bridge above is called Millheugh Bridge which lies just forward and left of the Applebank. The original stone "Brig" was built in 1790 and washed away in a storm in 1934. 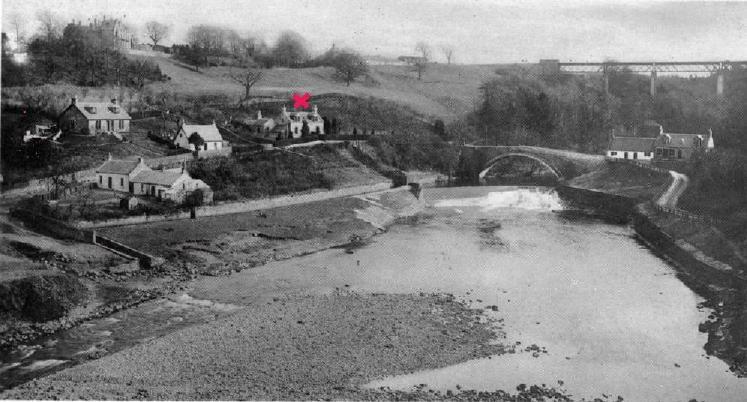 You can see the position of the old bridge spanning the Avon in the photo taken below around 1900. 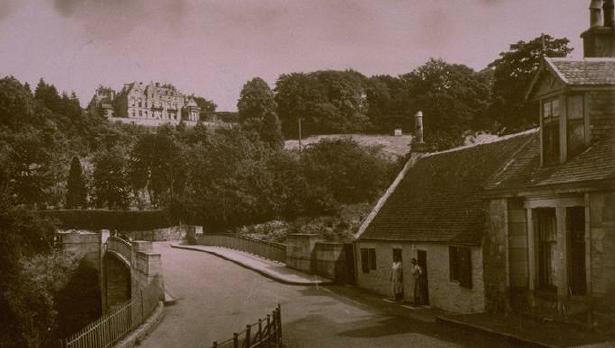 The Applebank Inn is marked with an 'X' and Broomhill House can be seen high up on the hill. Seen in the distance on the above photo is the Morgan Glen viaduct is the most famous landmark of the town of Larkhall. Completed in 1904 by Willian Arrol and Company this railway viaduct, with the nearby and now demolished Stonehouse viaduct, linked the towns of Larkhall and Stonehouse by a branch line that was eventually closed in 1964. Standing 45m (148 feet) in height and having six spans which cover 69m (226 feet) it is the tallest overland railway bridge in Scotland and the 2nd highest in Britain although it now lies in a state of neglect and disrepair. On June 8th 2005, one month before our Sorbie gathering a 12 year-old local girl miraculously survived a fall from the bridge, hitting several trees on the way down which broke her fall. She did however suffer serious injuries, breaking her back and suffering damage to her arm and leg. However, doctors have said that despite the severity of her injuries, she should thankfully be able to walk again. The girl's mother called for the bridge to be pulled down but conservationists stressed it is of great local significance. Historic Scotland confirmed it wanted to retain the B-listed structure, but said it was happy to work with the owners to resolve the problem of trespass. A shame such an important structure has now become a serious hazard and a potential death-trap.